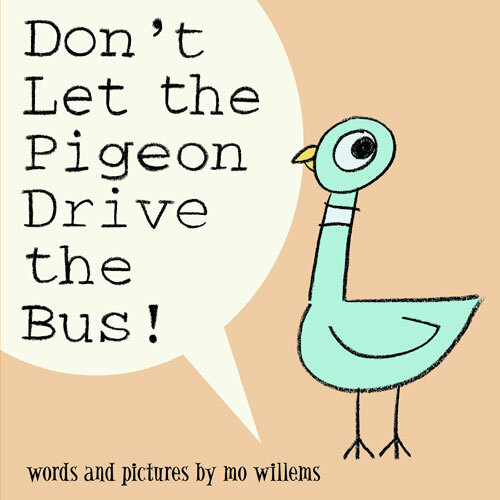 I first heard of Mo Willems a couple of years ago when I was browsing around at a bookstore and saw the title Don’t Let the Pigeon Drive the Bus! ; it was an intriguing title. The illustrations were child-like in their simplicity, yet able to vividly depict all these emotions I could instantly relate to, so I decided to pick it up for Addie. The unique aspect of that book is that it feels like a dialogue – it reads like the pigeon is standing right next to you. We always had a blast reading that book to Addie. My favorite part of interviewing Addie about her favorite Mo Willems books was when each time we explored a title, her face would light up and she would say, “I love that book!” or, “That book is soooo funny!” For a young kid, fostering a love for a favorite author is such a delightful way to help groom their passion for reading. Now that Start with a Book is an integrated part of all my reading explorations with my kids, I decided to see what resources I could find to expand our exploration of Mo Willems. 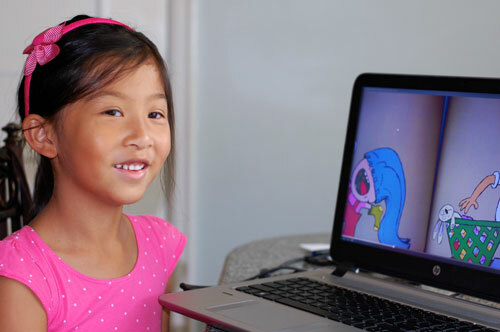 On the homepage, Fun ideas for writing caught my eye, as Addie had mentioned wanting to write a letter to Mo Willems. It just so happened under Summer Writing, Write to Your Favorite Author was one of the suggested activities. I looked through the bullets, and saw some great ideas that I made a mental note of, but with Addie being 5-1/2 (that 1/2 is very important, as evident in our intro video), I realized that they were better for older kids. 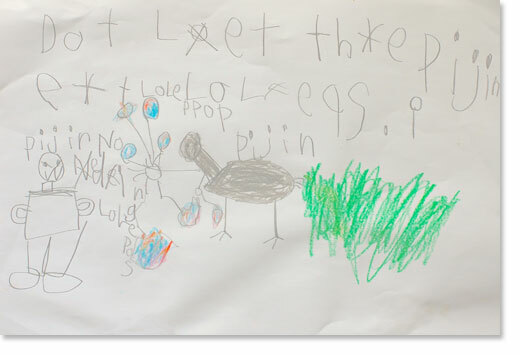 I asked Addie how she wanted to write to Mo Willems, and she said she wanted to draw some pictures and then write her information like name, address and school on the back of each picture, so that’s what she did. 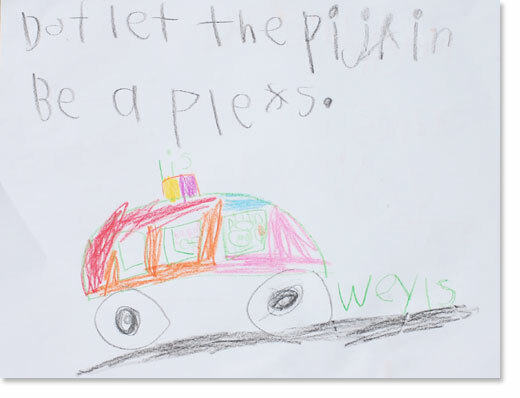 Here’s a picture she drew that was inspired by Don’t Let the Pigeon Drive the Bus! Addie’s version is Don’t Let the Pigeon Be the Police! Her second spinoff is Don’t Let the Pigeon Eat Lollipops! We also got to see a video interview with Mo Willems through Reading Rockets' author interviews. I was delighted to find the author interview collection. It turns out though I found his interview more fascinating than Addie did. I was completely engrossed in the entire interview, as I always find someone’s creative process fascinating to learn about. Addie checked out half way through. I quickly realized that in Addie’s mind, it’s not about getting to know Mo Willems himself better, it’s about getting to know the characters he’s created: pigeon, elephant, piggie and knuffle bunny. What we did stumble upon that did capture both Addie’s and Taylor’s interest was an animated reading of Don’t Let the Pigeon Drive the Bus!. We also found an animated version of Knuffle Bunny. Both of these weren’t official Mo Willems released YouTube videos, so I don’t know how long they will remain on-line, but for now they’re there, and are well done. 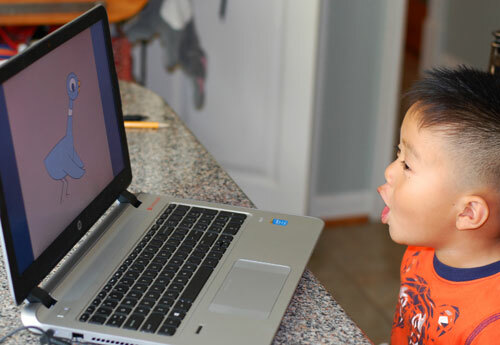 As you can see, my kids loved watching the animation and readings. 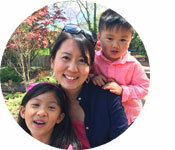 For Kindergarteners and older, check out the writing resources on Start with a Book. 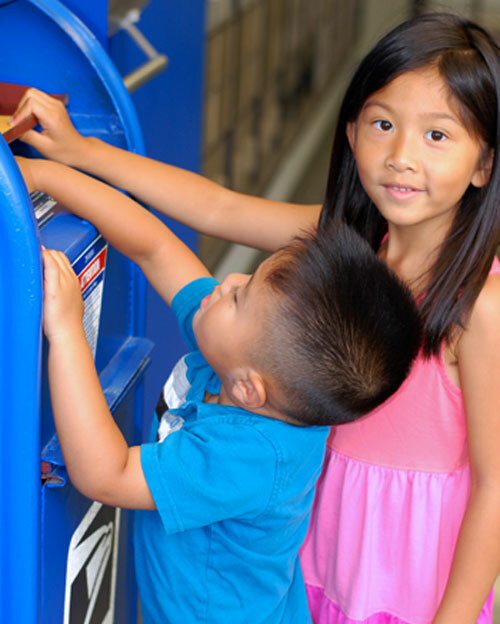 Writing is reading’s partner in crime – make it a regular activity for your child to enjoy this summer. Getting your child a notebook to use as a journal is great first step. It turns out there are lots and lots of book narrations on YouTube. As with anything on YouTube, always screen the video first, or watch with your kids before adding it to your viewing list. Fostering your child’s love for an author is a really fun way for both of you to enjoy books together, and watch your child’s love for reading grow – a priceless gift. For me it was, and still is, a love affair with the books written by Roald Dahl, Shel Silverstein and Laura Ingalls Wilder. Dear Mo, if one day you ever read this blog posting, thank you for bringing humor and joy to our lives through your gift of storytelling. Each child and grown-up you’ve touched, loves reading a little more and laughs a little more than they did before they met the wonderful family of characters you’ve created.